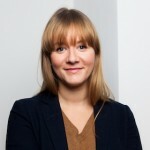 Michelle Langlois is a reporting programme advisor with Shift and works on the UNGP Reporting Database. Reporting Trends & Insights: Are Companies Making the Commitment to Respect Human Rights? Five years after the endorsement of the Guiding Principles at the UN, companies are increasingly adopting human rights policy commitments and starting to embed them across all functions. 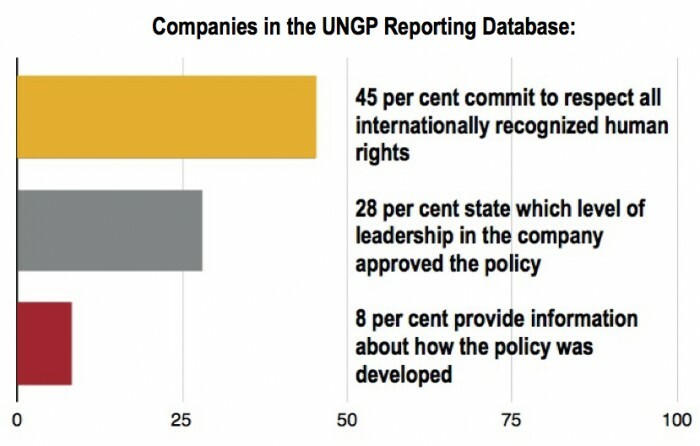 Among companies whose reporting is reviewed in the UN Guiding Principles Reporting Database, 43 per cent have a stand-alone human rights policy. This number goes up to about 75 per cent when also counting commitments included in a Code of Conduct. While we see positive developments in policy commitments at an overall level, a number of weaknesses are evident across company reports and websites. The graph here demonstrates some key weaknesses. What is expected of companies in terms of the policy commitment? Principle 16 of the Guiding Principles states, “[a]s the basis for their responsibility to respect human rights, business enterprises should express their commitment to meet this responsibility through a statement of policy”. Be reflected in operational policies and procedures. Following Principle 12, commitments should also cover all internationally recognized human rights – at a minimum those contained in the International Bill of Human Rights and the eight ILO core conventions. What is the overall quality of policies? While there is clearly an upward trend in the number of companies that have a policy, the quality of those commitments varies widely. Not all policies are framed in clear language, and not all are integrated in appropriate governance processes and documentation. Those companies in the Reporting Database that have opted for a stand-alone policy generally have a more coherent narrative about how they respect human rights and embed this commitment throughout their operations. For instance, 71 per cent of companies in the Database with a stand-alone policy fully commit to respecting the core internationally recognized human rights, and 95 per cent of those companies state that the commitment applies to both the company and its suppliers. That said, it’s not necessary to have a stand-alone policy. A well-written commitment in a Code of Conduct or other document can also provide clarity and specificity. Nestlé’s Corporate Business Principles offer a good example. 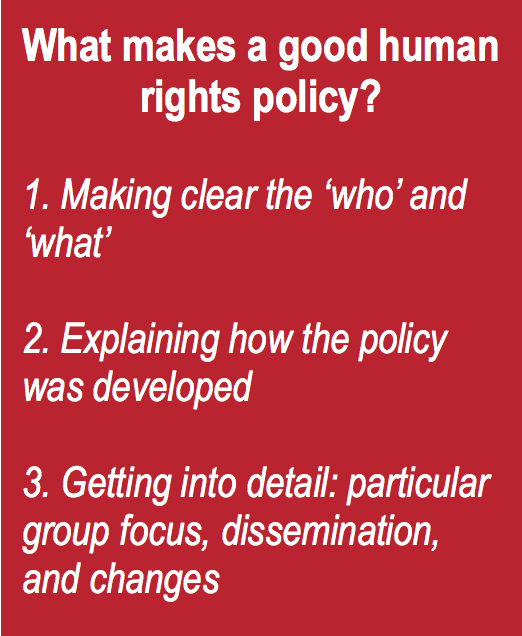 What makes a good human rights policy? Who does the commitment apply to: Just the company? Does it include its subsidiaries? Does it extend its expectations under the commitment to its value chain? What specific standards form the basis of the commitment? “The Coca-Cola Company’s Human Rights Policy is guided by international human rights principles encompassed in the Universal Declaration of Human Rights, the International Labor Organization’s Declaration on Fundamental Principles and Rights at Work, the United Nations Global Compact and the United Nations Guiding Principles on Business and Human Rights. Another interesting example of answering the ‘who’ and ‘what’ is Microsoft’s Global Human Rights Statement. Microsoft takes an extra step towards policy coherence by referring to its Global Human Rights Statement in its Standards of Business Conduct. Another useful – but rarely reported – piece of information relates to the process behind the adoption of the human rights policy. Did the company consult with stakeholders? Was company leadership involved? Was the policy approved at the most senior level of the company? This information helps readers understand how seriously the company took the development of the policy, and how it sees it as integrated into corporate governance. The most complete human rights commitments in the UNGP Reporting Database include additional detail, beyond the ‘who’, ‘what’ and basic information about the development process. One type of relevant information is whether the company takes a particular group focus: does the commitment cover all individuals and groups who may be impacted by the company’s activities and through its business relationships, is it limited to certain groups, or does it cover everyone while highlighting some for particular attention? Information about how the policy is disseminated to internal and external stakeholders and to business relationships is also highly relevant – stakeholders obviously need to know about the policy in order to support its implementation. Finally, some companies choose to share developments and changes to their human rights commitment. This information is rarely essential, but when we see it, it contributes to better transparency and shows that the policy is a living document that is kept under review. For example, PepsiCo added a simple statement to its 2014 GRI Report: “During 2015, we will undertake a fundamental review of our human rights policy with an external NGO”. The UNGP Reporting Database currently hosts the human rights disclosure of 40 companies from four sectors: apparel and footwear, extractives, food and beverages and information and communications technology (ICT). Overall, 43 per cent of companies have adopted a stand-alone human rights policy. The food and beverage sector has the most: seven out of ten companies have a stand-alone policy, in contrast with only one apparel company (H&M), and four companies in the ICT and extractives sectors respectively. Thirty-three per cent of all companies include a commitment to respect human rights in their code of conduct. This is clearly the preferred form of commitment for apparel companies, with 7 out of 10 choosing to express their commitment in a code of conduct rather than a stand-alone policy. The rest, about 25 per cent, either have a very basic statement on human rights (consisting of one or two sentences), a commitment only covering suppliers, or no mention of human rights whatsoever. Yet only 45 per cent of all companies commit to respecting the full range of internationally recognized human rights. Instead, we see commitments that broadly reference ‘sustainability’, but not human rights. In other instances, companies commit to respecting only a partial list of human rights, especially labour rights such as those related to non-discrimination, harassment, health and safety and forced labour. While it’s acceptable for a company to concentrate its efforts on focal or salient issues, the overarching commitment should cover all human rights since business impacts can affect the full spectrum of rights. Looking by sector, apparel companies have relatively poor human rights commitments, with only H&M committing to the core internationally recognized human rights. In contrast, the extractives and food and beverages companies in the Database do well, with 80 per cent and 60 per cent of companies respectively committing to respect the core human rights. Finally, of the companies so far included in the Reporting Database, those headquartered in Asia tend to have weaker human rights commitments. None expressly mentions the International Bill of Human Rights and ILO core conventions. However, two companies have indirect commitments with references to the Ten Principles of the UN Global Compact or ‘internationally recognized human rights’. Samsung stands out with disclosure on most key elements of a good human rights commitment. Who’s making the commitment, and who’s expected to comply with it? Whose rights are covered by the policy? Which human rights does the policy address? Did stakeholder consultations inform the development of the policy? Was the policy approved at the most senior level of the company? How is the policy disseminated with internal and external stakeholders and business relationships? For a structured and principled way to report on these questions, see Part A1 – What does the company say publicly about its commitment to respect human rights? of the UNGP Reporting Framework. And for more guidance on how to develop a human rights policy, see A Guide for Business – How to Develop a Human Rights Policy published by the UN Global Compact and the UN Office of the High Commissioner for Human Rights. Ultimately, a good human rights policy commitment is just the first step for companies and does not necessarily mean that human rights risks are being effectively identified and managed. As this series continues, we’ll look at reporting on these more applied areas of companies’ human rights performance.